If you’re trying to get more done every day, time management is critical 9 Best Time Management Tools for Staying Organized 9 Best Time Management Tools for Staying Organized The time management tools shown here will assist you with making the most of your days. Suitable for any business or personal situation. This is the time to organize your life! Read More . Losing track of time or wasting precious hours on unimportant tasks is a big problem. 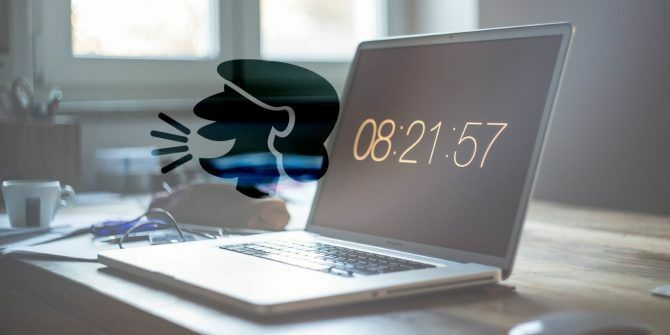 Whether you’re on a strict time management system like Pomodoro How a Simple Pomodoro Timer Made My Life Better How a Simple Pomodoro Timer Made My Life Better The Pomodoro Technique is one of the simpler time management life hacks. Break through distractions with the help of 25-minute chunks and a timer. It could be a life-changing routine change if it suits you. Read More or just want to remind yourself how much time has passed, your Mac has a built-in option that can help. It can audibly announce the time at specified intervals. To enable this, first open System Preferences from your Dock, or by clicking Apple > System Preferences in the menu bar. Click the Date & Time entry. Here, you’ll see an option near the bottom labeled Announce the time. Check the box, then you can select which interval for the time announcement. The default is On the hour, but you can also select every half hour or every 15 minutes. To get fancy, you can also customize the time announcement voice. Click the Customize Voice button and you can change a few options. Use System Voice is the default, but you can select from a few other voice, both male and female. Select Customize from the voice drop-down box for even more options. After you pick your favorite voice, you can change the speed of speech and set a custom volume. Click Play to hear a brief sample of your current settings. When you’re happy, click OK, and you’re all set. Your Mac will now announce the time to you on the interval you’ve specified. Regularly hearing what time it is will help you keep track of how much time you’re spending on various tasks, even if you forget to check the clock yourself. Give this a try and see if it works for you! For more helpful tools hiding in your Mac, check out useful utilities you’ve probably never used 9 Useful In-Built Mac OS X Utilities You've Probably Never Used 9 Useful In-Built Mac OS X Utilities You've Probably Never Used While you're not forced to become familiar with them, there are a handful of useful utilities included with Mac OS X. Read More . Do you like hearing regular time announcements while you’re working? Share your Mac productivity secrets with us below in the comments! Love this feature. However, I need it to mute at night to keep from bothering everyone in the house. How do I prevent this from running say from 10pm till 6am?